Hope you all are well- today I am participating in a challenge that I have never done before- the Mama Elephant and me challenge! So without further a do, here is my card! I inked up my new Summer Garden Stamp set from ME and SSS, and stamped the flower images in Hero Hues black ink (which is waterproof). I did the same with the sentiment (from SSS). I then used some of my ink pads and an aqua brush to add a watercolour wash over the flowers. I added a few flicks of colour with the brush, added a few clear sequins and adhered the card panel onto a black card base, and that was my card all done! 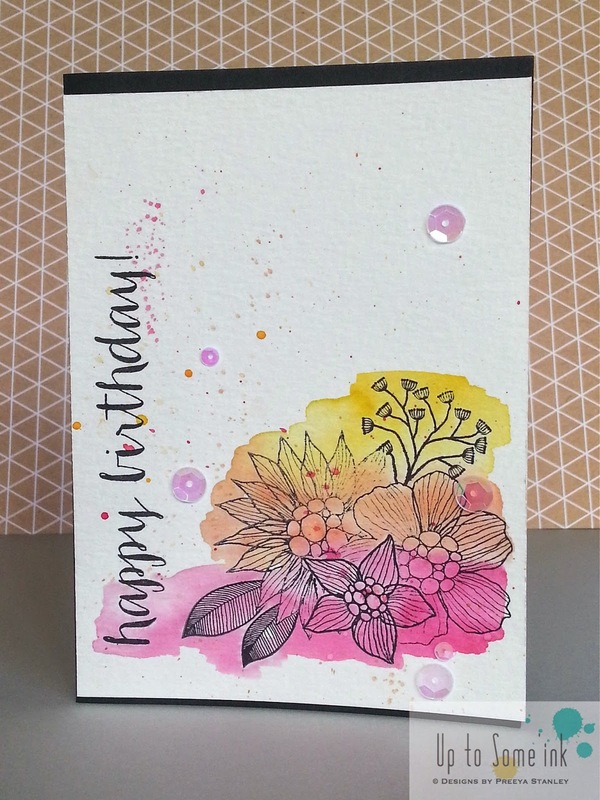 Super fab background colour and stamping! So glad you could share with us at Mama Elephant & Me! Wow, beautiful card! I love the colors! What a beautiful card. So vivid and colorful. I love it - just as the rest of the cards on your blog I looked through in the last 15 Minutes. Hi Preeya, I absolutely love your blog and your work is amazing..... thought I would surprise you by commenting on a post and saying...... I would love you to be a part of the Fancy That Dies design team if you are still interested.